Having fought off competition from over a hundred entrants, Hey Girls, a 'Buy One Give One' sanitary social enterprise tackling period poverty in the UK, is celebrating after being crowned Virgin StartUps Scottish Business of the Year 2018. 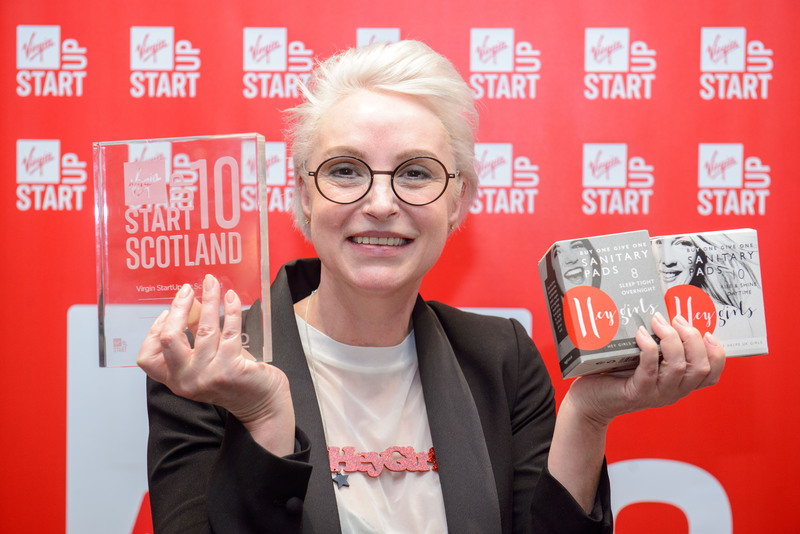 Over the past three months, Virgin Startup10: Scotland has been searching for Scotland’s best startup businesses and entrepreneurs, for the chance to win ‘startup can’t buy prizes’ including mentoring and support from a leading Scottish law firm. Pitching to an all-star judging panel, comprising of a mix of Scottish entrepreneurs including Jackie Waring, Investing Women, Bob Keiller CBE, Scottish Enterprise, Leah Hutcheon, Appointed, Callum Stuart, Mallzee and special guest Paul Wheelhouse, Minister for Business, Innovation and Energy, all ten finalists showcased the fantastic breadth of startup and entrepreneurial talent in Scotland. Hey Girls, founded by mother Celia Hodson and her daughters, Becky and Kate, took home the top prize and will receive mentoring, marketing and PR support from Virgin StartUp as well as the all-star judging panel members. Hey Girls is tackling period poverty in the UK via a 'Buy One Give One' model: every time a customer buys a packet of towels for themselves, they also pay for one to be donated to someone who is struggling with these additional costs of living. Having been a single parent, Celia understands first-hand the financial strain of buying sanitary protection when struggling to survive on benefits and recognises that the situation for women hasn’t changed in twenty years, leaving her with the decision that something had to be done. Commenting on the achievement, Celia Hodson founder of Hey Girls, said: "We’re thrilled to have been crowned Virgin StartUps Scottish Business of the Year 2018. “It’s crazy to think that we’ve achieved this success having only just launched in January. Jackie Waring, the founder & CEO of Investing Women, added: “It was very difficult to choose an overall winner; each finalist gave a compelling pitch. Business and Innovation Minister Paul Wheelhouse said: “Hey Girls is an incredible example of innovative, socially conscious entrepreneurship and will be an inspiration to other new start-ups throughout Scotland. “Scotland’s future economic success lies in the strength of our SMEs, and – like Virgin StartUp – the Scottish Government is committed to supporting a diverse and vibrant entrepreneurial culture through Scotland CAN DO.